Our favorite snack is now welcome at the breakfast table. 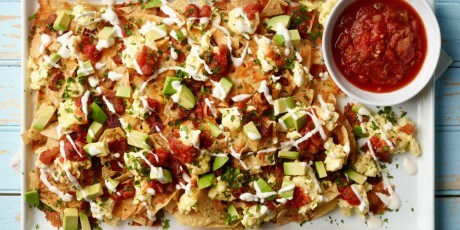 These easy nachos come together quickly while you make the eggs and are easy to double for entertaining. 1. Preheat the oven to 400ºF. Line a baking sheet with heavy-duty foil, shiny-side up. Spray evenly with cooking spray. 2. Lightly beat the eggs, milk, 1 1/2 teaspoons salt and 6 grinds of pepper in a medium bowl and set aside. 3. Cook the bacon, in a large nonstick skillet over medium heat, using a wooden spoon to break the bacon apart as it cooks, until golden brown and crisp, 4 to 5 minutes. Transfer the bacon with a slotted spoon to a small paper towel-lined plate. Reserve the skillet with 2 tablespoons of bacon drippings in it. 4. Pile half the chips on the prepared baking sheet. Sprinkle half the Cheddar, half the Monterey jack cheese and half the cooked bacon over the top. Create a second layer with the remaining chips, Cheddar, Monterey jack and bacon. Bake until the cheese is completely melted, about 7 minutes. 5. While the nachos are baking, add the eggs to the pan and put over low heat. Cook slowly, stirring occasionally with a heatproof spatula, until the eggs are set but still moist, about 5 to 7 minutes. Remove from the heat. 6. Serve the nachos on the hot sheet pan or transfer to a serving platter. Top with the warm eggs, salsa, cilantro, avocado and a drizzle of sour cream. Serve with hot sauce and a side of salsa.